While every Registered Dietitian has certain requirements to become a RD, the path is always different. So here is some insight in my not-so-normal path. At first, I didn't even think of nutrition. When I started my college career, I worked as a physical therapy technician. I wanted to help people with exercises and pain management. But one day, while working with one of the physical therapists, he said, "you know, if this guy ate healthy and didn't have all this extra weight on him, he probably wouldn't have needed this double knee replacement." That really spoke to me. He was right - to help people, I needed to help them before they got to this point. The next day at school, I declared my major in Nutritional Sciences. I knew I needed to start getting my feet wet in the nutritional world. So, I took a job as an eating disorder technician at a inpatient rehab facility. Being an Eating Disorder Technician was one of the most interesting ways to get into dietetics. As a tech, I was responsible for documenting how patients made their plates, how much they ate, and other behavioral observations made before, during, and after the meals. I also held the weigh-in sessions - an unforgettable experience. Seriously. If you are a dietetic/nutrition student and need a part-time job, I highly encourage you to look into ED tech work. Not many get the opportunity. The RDs I worked with were so supportive in my education and career advancement. They let me sit in on group sessions, individual sessions (with permission from the patient, of course), and even team meetings where I was truly treated as an equal. And then, into the real world. After graduating, I moved to Texas to be with my boyfriend who recently was stationed at the Army base. I then took a job with WIC as a Nutritionist. I was able to manage a clinic and see high-risk infants, women, and children. Another great experience available to me before becoming a RD. With my resume beefed up, I applied for an internship with Iowa State's Distance Internship Program. I worked with the local AND board to network for preceptors - something I had to do on my own with a distance program. It was actually required in my application! Having to do my own internship planning and preparation was a great way for me to network in the local dietitian pool and develop my self-promotion skills. I cannot say enough good things about Iowa State's Internship Program. I had practice exams, a huge network of fellow interns across the country, and still some autonomy and flexibility within my own internship track. They even gave me community nutrition credit for my work at WIC! Score!! For those looking into internships, you should really consider the distance programs. For real. I felt I learned more in this atmosphere than I could with a traditional internship. The preparation they gave me combined with the autonomy in the program is what helped me pass the exam on the first try. 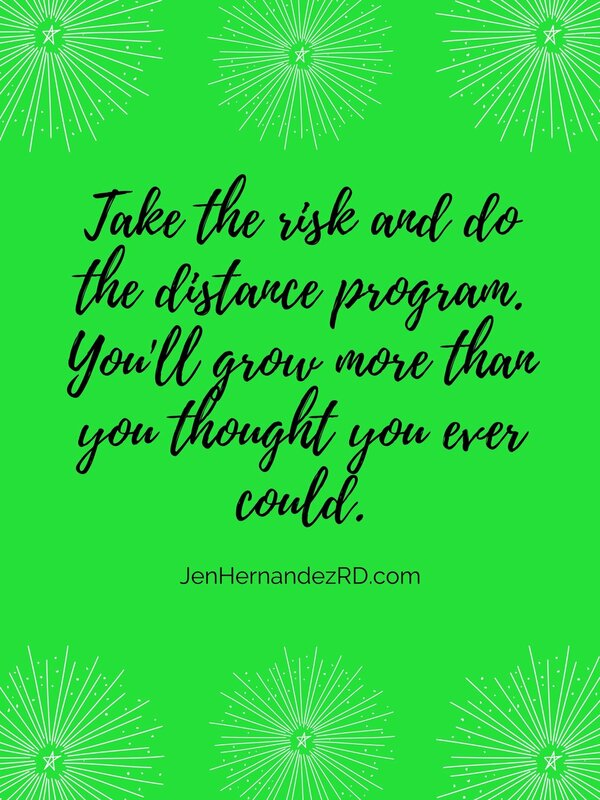 Seriously - don't discount a distance program. I became a well-prepared, well-connected Registered Dietitian. I landed my first RD job even before I passed my exam! What a confidence booster! Once I passed, they promoted me from "Nutritionist" to "Registered Dietitian" - something RDs can understand as an amazing career milestone. In this job, I worked in a long-term care area for elderly, where I got to learn more about multiple health conditions, food service, and working with an IDT (interdisciplinary team). It was a great starting role, but not the typical hospital role that most dietitians start in. It was great for me! Don't think you need to start the same way as everyone else. Since then, I've worked in a hospital, dialysis clinic, and now community setting. It comes with the role of military spouse - I can't keep a job for more than a few years. But that is why I am expanding into private practice and virtual nutrition coaching, so I can help more people no matter where we are stationed! A real dream come true! I hope this gives some of you an idea of an alternate way to become a RD. If you have more questions about this pathway and my experience, contact me.